Instant Pot Hummus is a delicious dip made from chickpeas. It has a nutty, garlicky, lemony flavor, and is a little earthy. 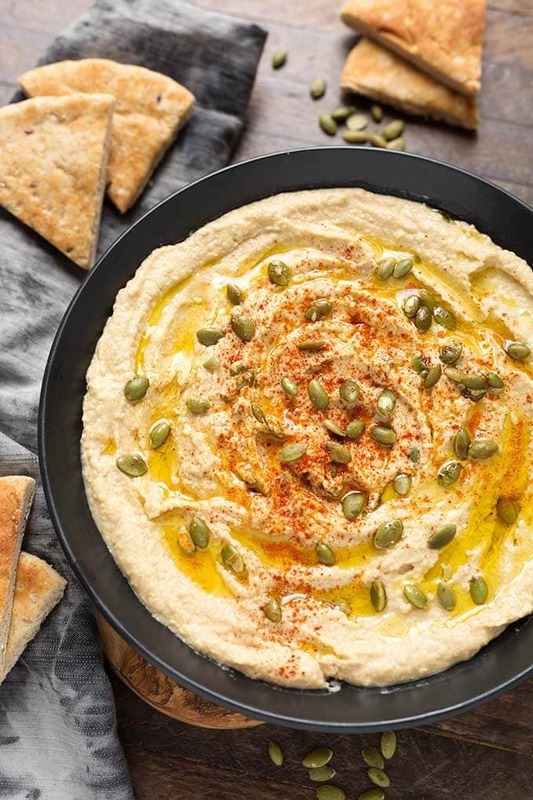 Made from scratch using dry chickpeas, this pressure cooker hummus recipe is a favorite party dip recipe! 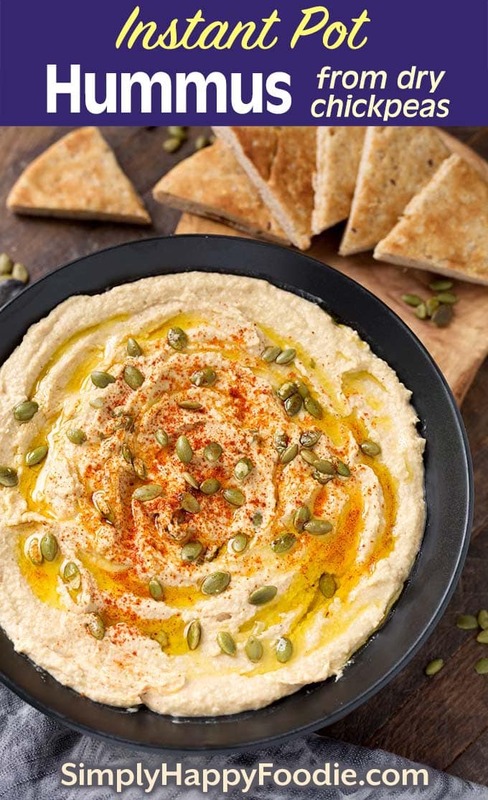 Hummus is a delicious dip made from chickpeas, AKA garbanzo beans. This is a recipe for pressure cooker hummus using dried chickpeas. It’s super creamy and tasty! 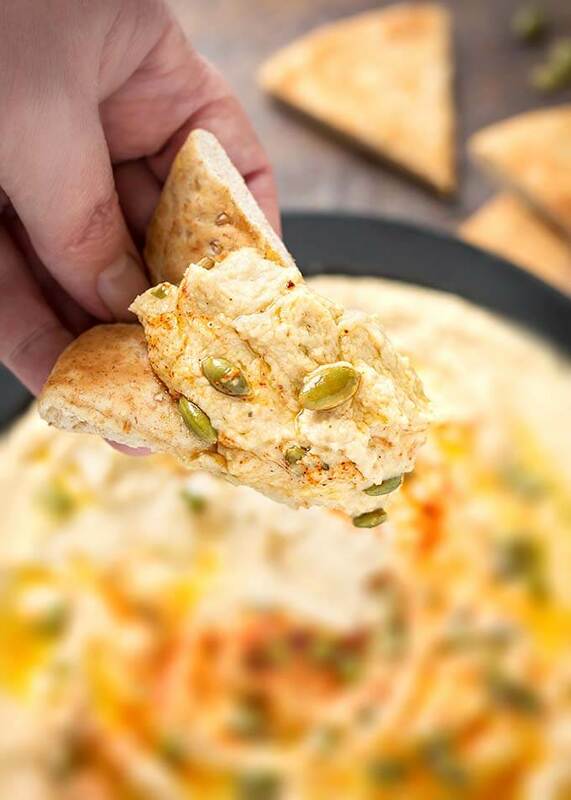 Get out the carrot sticks, pita bread, chips, anything that you can dip into this heavenly Mediterranean concoction! It is kind of addicting! How great that it is also healthy! I first tried hummus about 20 years ago, and made sure that I learned how to make it. I even published my recipe in my son’s school cookbook! Who knew I’d end up a food blogger?! I’m so glad I did! Why do I need to add baking soda to the water? Great question! Baking soda helps to break down the skin on the outside of the chickpeas. This way you don’t need to remove the skins. They will blend up smooth. Who wants to peel EVERY SINGLE little chickpea? Just be sure to rinse the chickpeas after cooking to get rid of any baking soda aftertaste. What can I eat this pressure cooker Hummus on? Use as a dip for pita chips, carrot sticks, or any favorite vegetable. Spread on wraps and sandwiches. Can I just use Canned chickpeas? Yes, and if you do, you will want to use my recipe for Classic Hummus that doesn’t require cooking. Instant Pot Hummus is a delicious dip made from chickpeas. It has a nutty, garlicky flavor and is a little earthy. 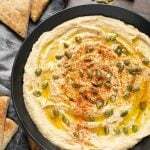 This pressure cooker hummus recipe is a favorite dip recipe! Add the rinsed chickpeas, baking soda, and water to the pot. Stir. Press the Pressure Cook/Manual button or dial, then the +/- button or dial to select 35 minutes. High Pressure. Open the lid and add the cooked chickpeas to a strainer. Rinse well with cool water. Set aside. Add the lemon juice and garlic to a food processor. Pulse several times until the garlic is well minced. Optional Step: Push the garlic into the lemon juice to submerge it. Let sit for a few minutes. This helps take some of the sharp taste from the garlic. The longer it sits in the lemon juice, the better. Add the chickpeas to the food processor and pulse a few times. Add the tahini, cumin, salt, pepper, paprika, and cayenne, if using. Pulse several times, then process for about 10 seconds. Start drizzling in the warm water and the mixture will start to loosen up. Turn on the processor again and drizzle in the olive oil. Then taste the hummus and adjust salt, or any of the other seasonings to your taste. 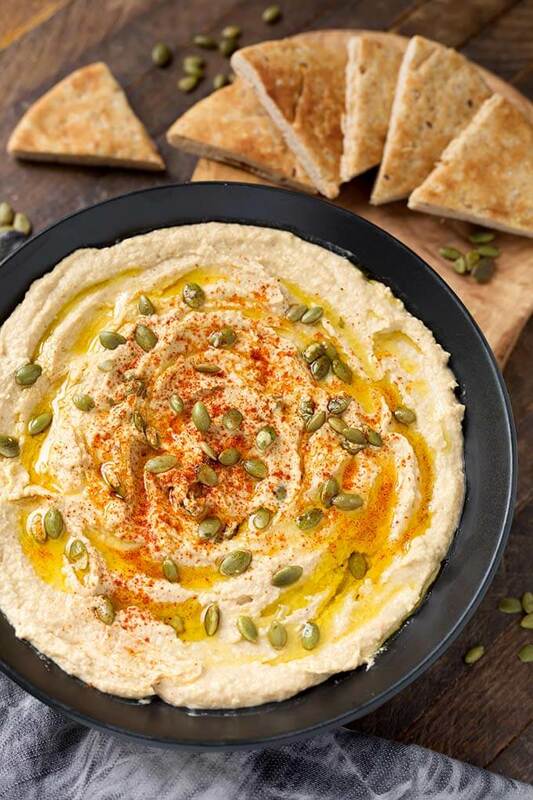 Transfer hummus to a serving dish and drizzle with a little more olive oil. Add a few shakes of paprika, and sprinkle on the pumpkin seeds. Serve with pita bread, chips, carrot sticks, or any favorite vegetable. Also spread on wraps and sandwiches. I made this because I was searching for a hummus recipe and found this one. It is so good! This will be my go to hummus recipe!